A heartwarming picture emerged on social media of a Chinese lady holding an umbrella for a Sikh uncle at a traffic junction during a sudden downpour. In a photo shared by Facebook user Jonathan Vendi on Saturday, December 8, to the 50 Shades Brighter (Singapore) Facebook group, the woman was barely shielded from the rain by the umbrella. She held it over the Sikh uncle to protect him from the rain as they both waited at the junction. Facebook page All Singapore Stuff reposted the submission, gathering comments from internet users who saluted the lady for her action. Not much to say, as this picture, indeed, speaks way louder than words. 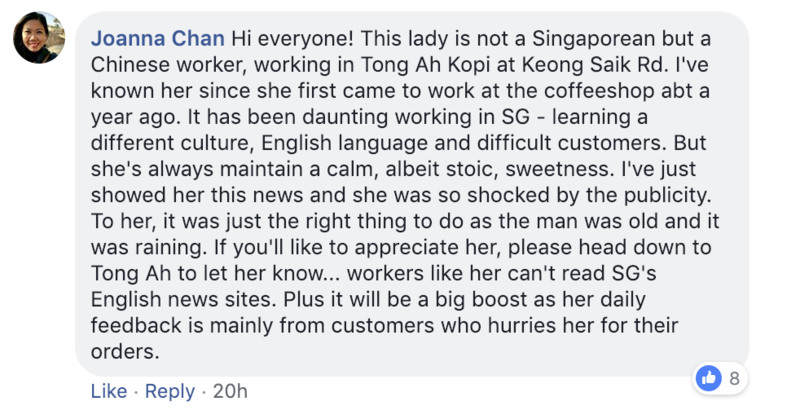 Netizens have praised the Chinese lady for her kind act, and a commenter noted that she is a Chinese worker who started working at a coffee shop at Keong Saik a year ago.